Holland Roden was photographed carrying Tyler Ellis at the 2017 MTV Movie And TV Awards this past weekend in Los Angeles! The Teen Wolf star accented her fringe dress with her Tyler Ellis Lee Clutch in Blue Crushed Velvet ($1,595, www.tylerellis.com). Learn more about Tyler Ellis handbags. 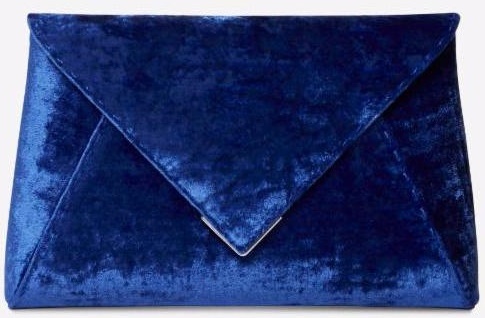 Here is a closer look at the blue crushed velvet clutch bag. You may also be interested in the following blog post about Holland. She was also in a celebrity article we posted back in 2014 called, Fashionable Finds on the Celebs. Learn more about the 2017 MTV Movie & TV awards. By the way, Emma Watson won the Best Actor in a Movie award. 'Beauty and the Beast' was 'Movie of the Year' and Emma Watson won the 'Best Actor in a Movie' as men and women competed jointly in the acting categories.